There’s not too much a bottle of booze can’t fix! I’m so excited about your upcoming trip! I’m sure you will have some more good stories to add to this one. Ah, those trips of youth, taking off at the spur of the moment. Can’t wait to hear about this one. Best opening shot EVER! Awesome post too. Glad you found fun in every situation. I remember driving behind a car in Geelong once, and the left rear tyre fell OFF – all the way off! It was funny to watch, but I’ll be it wasn’t funny to the poor people it happened to – or to your group either! Oh my sorry to shock you. That was a scene from a disaster movie. 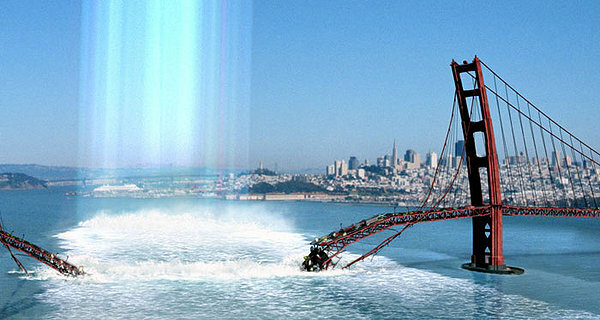 The city of New York and the Golden Gate bridge are ever popular places to destroy by Hollywood screen writers. True, the tire incident wasn’t funny at the time, but we laugh about it now. That’s quite a story! Love the part about a bottle of champagne in your purse–my kinda girl! Now this is my kind of travel story, purple hair and all. All of us on-the-road junkies have a few road trips from hell, and they’re always end up being just perfect the way they are. Thanks for sharing and bringing a smile to my face. Glad you enjoyed. I crack up laughing every time I think of that trip. It’s made many a good drinking tale at family parties.